Background: Lactoferrin is a multifunctional protein found in breast milk. 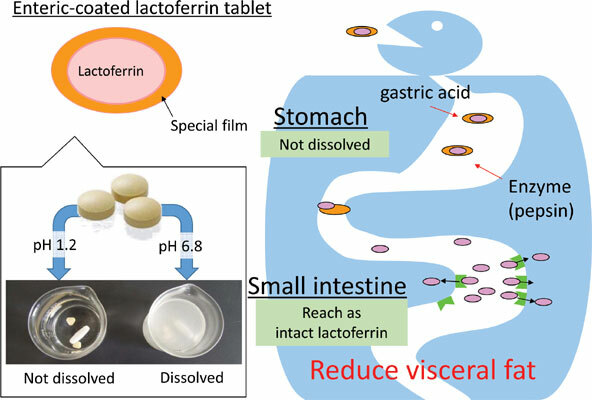 We previously reported the anti-obesity effects of enteric-coated lactoferrin (eLF). Objective: As the previous study included some subjects with high Body Mass Index (BMI) or low-Density Lipoprotein cholesterol (LDL-Cho), we investigated the antiobesity effect of lactoferrin excluding those subjects. Method: We conducted a subgroup analysis of a previous report excluding subjects with BMI ≥ 30 and/or hyper-LDL cholesterolemia. Results: Of the total 26 subjects in the previous study, 7 in the eLF group and 6 in the placebo group match the above criteria. The subgroup analysis revealed a significant decrease in visceral fat in the eLF group at week 8 compared with that at week 0 (-10.2 cm2, P < 0.01); no differences were observed in the placebo group. The mean visceral fat was also lower in the eLF group at week 8 compared with the placebo group (-16.2 cm2, P < 0.01). A significant decrease in BMI was observed in the eLF group at week 8 (-0.38 kg/m2, P < 0.05) compared with that at week 0. No differences were observed in the placebo group. The mean BMI was also lower in the eLF group at week 8 compared with that in the placebo group (-0.60 kg/m2, P < 0.05). Conclusion: eLF reduced visceral fat and BMI excluding subjects with obese and/or hyper- LDL cholesterolemia. Lactoferrin, enteric-coated, visceral fat, BMI, RCT trial, subgroup analysis.